When a person dies, they typically die of what is referred to as "cardiac death." This type of death occurs when the heart no longer beats to provide blood to the body and brain, which results in death. The vast majority of deaths, approximately 99%, are cardiac deaths. However, there is another type of death, which is called brain death. Less than 1 percent of all people are ever pronounced brain dead. Brain death is both a clinical and legal finding of death. The concept of brain death can be very confusing because the person's heart is still beating and their chest will still rise and fall with every breath from the ventilator. The skin is warm and the person may appear to be resting comfortably, rather than critically ill and without brain function. This is because the worst of the physical damage is actually hidden in the brain, rather than visible on the body. Brain cells do not effectively regenerate. This makes it difficult for the brain to recover from injury. If the brain is starved of oxygen long enough for brain cells to die, they will not be replaced. If enough damage occurs to prevent the brain from receiving blood and oxygen, and the brain goes without oxygen long enough, brain death may result. The physical examination is done to determine if the patient is responsive. If they are not, the physical exam would check for reflexes. A patient who is brain dead will not have any brainstem reflexes. For example, a typical patient would blink or move their head if someone touched their eye with a piece of cotton ball. A brain-dead patient won't blink, flinch or try to move away if a doctor touches their eye with a fuzzy piece of cotton. Therefore, if there is no blink, that implies that the brainstem is not functioning properly. Another type of physical testing is the cold caloric. This test is done by using a syringe of ice cold water and injecting it into the ear canal. A patient who is brain dead will have no response to this type of stimuli, but an individual who has brain function will have a response, which can range from eye movement to vomiting. The cold caloric test should never be done on an individual who is known to have intact brain function as projectile vomiting is typically the result. A patient who is sick enough for brain death testing will be on a ventilator. A patient who is truly brain dead cannot breathe without a ventilator. 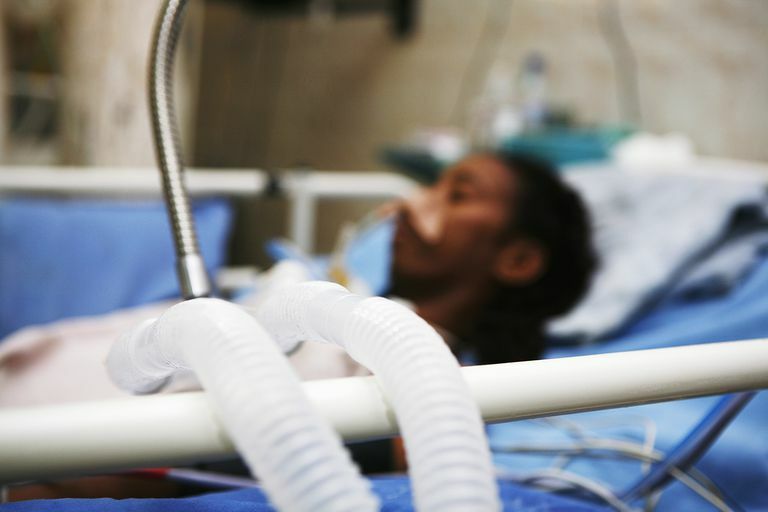 In order to test to see if the breathing reflex is intact or absent, the patient is removed from the ventilator in a procedure called an apnea test. Typically, an ABG is drawn immediately prior to the beginning of the apnea test, when the patient is taken off of the ventilator. Oxygen may be given to the patient during the apnea test, but the ventilator cannot help the patient breathe. A brain-dead patient will not take a breath during apnea testing. A typical patient will attempt to draw a breath when the brain tells the body it is necessary. For brain-dead patients, the brain is unable to send the signal to breathe and breathing does not happen without the support of a ventilator. After completing the physical assessment, the physician may elect to order additional testing. While it is typical for both a physical assessment and an apnea test to be done, in some cases the patient cannot tolerate apnea testing. Often, in those cases, a flow study will be done. These studies are done to see if blood is traveling to the brain through the bloodstream. If the study shows that no blood is reaching the brain, the test is consistent with brain death. Some physicians will use an EEG, or electroencephalogram, which is a test that measures brain waves. A patient who is brain dead will have a "flat" EEG, as brain waves will be absent. Atropine, a prescription medication that causes the heart rate to increase, an also be administered as an ancillary test for brain death because it does not work in brain dead individuals. If the heart rate increases notably after the medication is given, the patient is not brain dead. When a patient is pronounced brain dead, they are legally dead. Their death certificate will reflect the date when brain death was pronounced, not when their heart stops at a later time. In the United States, if a patient is pronounced brain dead and the patient meets certain medical criteria, organ donation may be an option. In many cases, the individual has already made their decision to donate and has indicated their choice on their driver's license or in their will. Practice Parameters: Determining Brain Death In Adults. American Academy of Neurology.